If you’re a regular OneWordBirds reader, you’ll know that I have a habit of going off on the occasional tangent. These supposedly bird-related posts tend to take a wander onto other topics of varying relevance, occasionally circling back to some vague avian reference. But not today. Today is the day I actually focus on a bird for once, and it’s a good one: the Secretarybird. If you were with me during the rage-fest that was Lammergeier, you may recall that Secretarybird is a recent addition to the list of one-word-birds, having lost its disqualifying hyphen (formerly Secretary-bird) last year. This is more than a little fortuitous for me, and a small consolation for that aforementioned vulture-related tragedy. 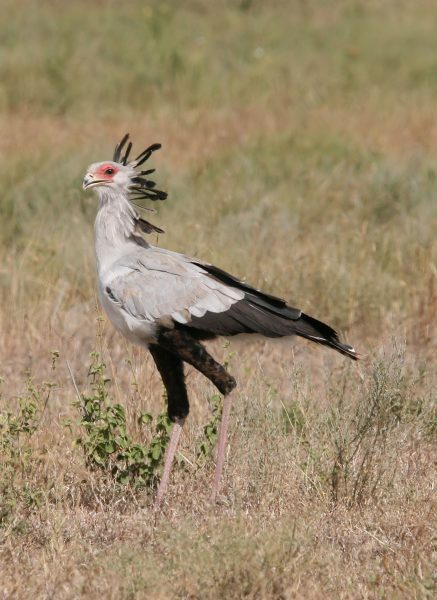 The Secretarybird’s inclusion is fortuitous for you too, reader, because this is a bird worth learning about. 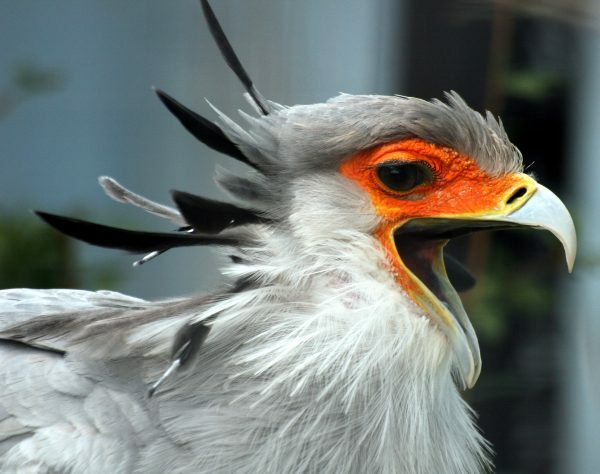 The formidable Secretarybird is as strange as it is spectacular. Imagine – if you will – a streamlined, predatory turkey on stilts. Or perhaps the result of a romantic evening between a velociraptor and a feather duster. Or a glam-rock hawk with legs for days. It’s weird, is what I’m getting at here. The Secretarybird is fundamentally a raptor, closely related to the hawks and eagles but with some key distinctions. Perhaps most notable are its long dancer-legs, atop which perches a roughly eagle-shaped body. The Secretarybird reaches a total height of up to 4’6 (almost a metre and half), meaning it could very nearly look you straight in the eye. Were it to do this, you would find yourself staring at a featherless, red face surrounded by grey plumage, with dark eyes and an intimidating, hooked beak. Its talons are also curved and sharp, completing the raptor toolkit and giving you further indication that you should start considering an exit strategy. There are two theories regarding the Secretarybird’s unusual name, the first of which relates to its unique, loose crest of long, black plumes. These feathers resemble quill pens tucked behind the ear of a secretary, once apparently common practice. Alternately, the name may be from the Arabic “saqr-et-tair” meaning roughly “hunter-bird”. The bird’s scientific name – Sagittarius serpentarius – is worth dissecting too. Sagittarius means “archer”, probably likening the crest feathers to arrows in a quiver, while serpentarius alludes to one of the Secretarybird’s favourite prey items: snakes. The Secretarybird is indeed an impressive hunter, and unlike most raptors it undertakes this practice primarily on foot. This lanky lurker stalks slowly through the desert brush, keeping a keen eye groundward. When it spots an unlucky rodent, lizard or snake, it chases its quarry with lightning speed and then stomps – yes stomps – the animal to death. From a standstill the Secretarybird can stomp with a force equal to five times its own body weight. Take that Michael Flatley. This unusual hunting strategy may be the very reason evolution has produced the Secretarybird’s unique leg situation, as its ungainly proportions generally make it worse at everything else. The bird is both an awkward runner and cumbersome flyer, and it can’t even reach the ground to drink without crouching. But the Secretarybird is good at what it’s good at, and it uses its powerful legs to hunt prey as large as hares, mongoose or even young gazelles. Venomous snakes like cobras are on the menu too. The Secretarybird carefully and quickly strikes these from above, avoiding the snakes’ perilous defences. No creature is safe from the stomp. Just a perfectly normal bird. Not crazy at all. It should not be surprising – given the bird’s striking appearance and remarkable behaviours – that the Secretarybird has enjoyed some reverence in its native Africa. It adorns the South African coat of arms, and is the national emblem of Sudan. It has even, apparently, been featured on over 65 postage stamps from a variety of African countries. Historically the bird has been appreciated for its propensity for eating feared animals (like snakes) and pests (like mice), so it has been mostly left alone. It is now in decline – like much of Africa’s megafauna – due to habitat loss and alteration, but you can still see a Secretarybird throughout most of the continent. This week’s post comes to you unadulterated by tangents, dalliances or sidebars, and believe you me that was no easy feat. But I suppose some birds deserve the spotlight all to themselves. And while I would never play favourites or give preferential treatment, if there was one bird who merited a post all its own, it would probably be the incredible, undeniable, incomparable Secretarybird.